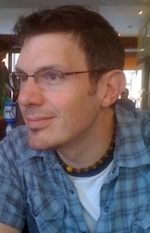 My name’s Jon Leitheusser* and I’m the Developer for Mutants & Masterminds and DC Adventures. I’m here to talk about what a developer does. It’s a little hard to explain because if I’m doing my job correctly, it should be mostly invisible to the outside world. The people who have the best idea of what I do are my writers, because I tell them what to write and help them to fully develop their ideas. But wait, let’s take a couple of steps back, because the writers don’t actually get involved until a bit later in the process and it’ll be easier to explain things if we start at the beginning. ongoing Heroes Journey adventure series. All of it is an attempt to make it easy to jump into the game. Second, I’m the one, with the rest of the company’s input, who determines what books we’ll be releasing and in what order. This is also the stage in which we decide which ideas have merit and which don’t. Some projects make it onto the schedule because they need to be released (like the core rulebook). Other ideas make the list because we know the fans want them. Still other ideas are slotted for "further development," which means they need some more think-time before they’re ready to hit the schedule. Sometimes those books make it onto the schedule, sometimes they’re shelved permanently. Once I have the schedule I create an outline for each book, though any given outline could be written by me or Steve, or whichever writer has a good handle on what that book is about. The outline breaks down each chapter, what needs to be covered in those chapters, any sidebars or specific topics that need to be included, and the number of words for each section. Sounds fun, eh? When the outline is finalized, usually after I’ve read it over and bounced ideas about how to improve it back and forth with the writer (one could say, further developed the idea), it’s time to hire the writer or writers and break the book into sections for each writer to tackle. This is the time of contracts! Administrative work is fun! Then, in theory, the writers write and turn their work in on time! More likely the writers eat bon-bons and watch the latest super-hero cartoons and call it research until I email and ask them how the manuscript is looking, then in the last couple of weeks before deadline they write like caffeine-powered madmen and ask for a couple extra days on their deadline, which I kindly grant. With the completed manuscript in hand, I give it a onceover to make sure it looks correct. If I feel the writer didn’t do exactly what was asked of them, or didn’t cover a section in-depth enough, or if something he or she wrote gives me an idea for something to expand upon, I ask the writer to dive back in and re-write, add, or expand. I play the role of editor and critic. At this stage, and all the others, I try to make the product better. Not to imply that the writers aren’t trying to do that, but they’re often so down in the weeds trying to crank out words that make sense together, that they forget to look up and consider how each piece fits into the larger whole. When the rewrites are done the book goes off to editing. Editors further improve upon the state of the manuscript. Like the developer, the editor’s job is to make the writer look good. I often say, if there’s anything wrong with a book it’s my fault, and if there’s something great about the book it’s because of the writer. Not because I (or the editor) don’t want to take credit, but because we’re there to catch the writer’s errors and let the writer’s ideas shine through. We’re in the home stretch now! Somewhere in the last couple of steps, I work with the writer to come up with art descriptions for the interior art (cover art was taken care of in the early stages). Art descriptions are fun but also challenging because you need to come up with images that help illustrate what the nearby text is discussing. Sometimes that’s easy, sometimes not so much. Descriptions for these tend to be a short paragraph with an image or two as reference for the artist. Hal Mangold, who I’m sure you’ll hear from in a future Roundtable, uses these descriptions to commission artwork. Hal, the writer, and I see early sketches and give the artist comments on what (if anything) needs changing before he or she finishes the image. With the final manuscript and art in hand, it all goes to Hal for layout. When it’s done we do a final proofing run to find anything obvious that needs fixing. When the book is in an acceptable state we release the PDF and collect any corrections we missed from our fans on the Atomic Think Tank provide us (thank you so much! ), which Hal makes to the files before the book goes to press. And then it’s onto the next book! There it is. My job as Line Developer. It’s not as fun as writing and designing all the time, it’s also not as detail-oriented as being a full-time editor. Hopefully now that you’ve read about what I do, you can see the hand I’ve had in the last few years’ worth of M&M products. That’s more than enough reading for now… Go play a game! many hats at Green Ronin. smothering or dousing, or a truly “fiery” temper! as examples when it comes to creating your own powers and characters. Profiles as we do bringing them to you! In October we had our yearly Green Ronin Summit. This is when all of our far-flung staff members rendezvous in Seattle for three days of debriefing, planning, and camaraderie. We look back at the previous year and plan for the coming year, with a lot of discussion and debate along the way. The Summit is the one time of the year we’re all together in the same room in a non-convention environment, so we try to make the most of it. One of the topics discussed was communication with our customers. Everyone at GR has an active web presence. You can find me on Twitter (@pramas) and Facebook and of course we have forums. Many of us travel to conventions throughout the year where we meet people and talk about Green Ronin. Over the past year, for example, I’ve been to conventions in London, Brazil, Las Vegas, Olympia, Indianapolis, and of course Seattle. Despite all that, we decided at the Summit that we could do better. From the number of times we got asked the same questions, it was clear that our message was not always getting out there. One of the ways we’ve decided to address that is with a weekly company blog. Each Friday a different member of our staff is going to write about goings on at Green Ronin. You’re reading the first of these Ronin Round Table posts right now. Topics will be eclectic, for such is the nature of our Ronins, but the overall effect should be to keep you all up to date on what we’re doing and what to expect in the future. I thought I’d kick things off with an update on what’s happening the rest of this year. The long-awaited Chronicle Starter for A Song of Ice and Fire Roleplaying just hit stores for the first time. We also announced the hiring of a new staff developer for SIFRP, Joe Carriker. He’s already hard at work on next year’s products, and we hope to get a lot more material out for the game. The Gamemaster’s Guide for Mutants & Masterminds is at print and should be out in early December. Though an M&M book, it’s also well worth it for DC Adventures GMs. Since the games share a rule set, all the material inside is as applicable to DC Adventures as it is to M&M. Speaking of DC Adventures, Heroes & Villains Volume 2 is in the approvals process. We’ll provide an update about the book’s release when it comes out the other side of that. Dragon Age saw the release of Set 2 a couple of months back, and that led to Set 1 selling out again. We have a reprint underway and that should also release towards the end of the month. Will Hindmarch recently came onboard as our new Dragon Age developer, and he’s working with me on a playtest document for Set 3. We intend to do another open mechanics playtest like we did with Set 2. We’ll have more to say about that before Xmas. Longtime fans know that I write a message each January about what’s coming up that year, and I will maintain that tradition. For now though I will say that our short term plans are to concentrate on the games we have and regularize their release schedules. We are not taking on any more licensed games, as we already have plenty to do with Dragon Age, A Song of Ice and Fire Roleplaying, and DC Adventures. Don’t take that to mean we have no surprises coming up, however. We made a lot of plans at the Summit, and there is coolness aplenty in the works. Thanks for reading. Come back next Friday for a look at the exciting world of Steve Kenson. 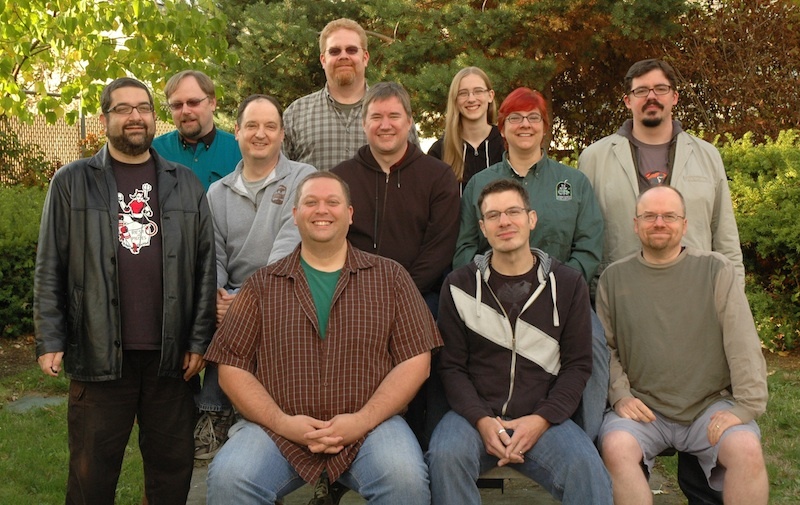 Green Ronin’s staff photo, taken at our 2011 GR Summit in Seattle. Back row: Bill Bodden, Marc Schmalz, Intern Kate; Middle row: Chris Pramas, Rich Redman, Hal Mangold, Nicole Lindroos, Will Hindmarch; Front row: Jon Leitheusser, Steve Kenson, Evan Sass; Not pictured (since we hadn’t hired him yet): Joe Carriker.